Chelsworth at Gladwins Farm Cottages in Nayland, near Colchester sleeps 8 people. 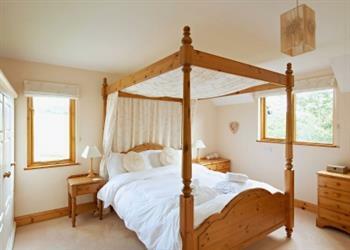 Gladwins Farm consists of nine bespoke, award-winning, family holiday cottages, some with hot tubs. With a shared indoor heated swimming pool, shared tennis court and unrivalled access to nature, Gladwins Farm is a perfect choice for a long or short relaxing break. Other facilities on site include sauna, games room and tennis court. There is even a beauty salon/hairdresser for a bit of pampering! The delightful cottages at Gladwins Farm Cottages (refs 31082, 31083 [Constable], 31084 [Lavenham], 31085 [Dedham], 31086 [Melford], 31087 [Wiston], 31088 [Hadleigh], 31089 [Kersey] and 31090 [Gainsborough]) can sleep between 2 and 8 people and can be booked together to accommodate larger families and groups of friends. Nestled in 22 acres of stunning, tranquil, beautiful countryside in the heart of Constable Country, this is the ideal base for families and couples. The secluded cottages are perfect for exploring East Anglia’s nature and heritage. The grounds link to public footpaths and every cottage has a fixed ordnance survey map of the area, which all makes for great walking. The on-site lake is stocked with coarse fish and perfect for anglers who love the peace and quiet. Local attractions include Lavenham with its historic, listed buildings, better known as ‘England’s best preserved medieval village’. A short drive will take you into Colchester which boasts several shops, bars and restaurants. For a more coastal scene take a drive to Frinton and enjoy the well managed coastline. The beach is 23 miles, with the shop, pub and restaurant all ½ mile from Gladwins Farm Cottages. Ground floor: Living room. Dining room with patio doors/kitchen with wooden floors. 1 twin bedroom with en suite shower room and toilet. First floor: 3 bedrooms: 2 double, one (5ft) with en suite shower room and toilet, one with en suite bathroom with shower over bath and toilet, 1 twin with en suite shower room and toilet. Wood burner in living room included. Cot. High chair. Five Freeview TVs. Dishwasher. Fridge/freezer. Small enclosed garden with patio, sitting-out area and furniture. Gas barbecue. Ample parking. Hot tub. Pets allowed at Gladwins Farm Cottages - Chelsworth. For a better idea of where Gladwins Farm Cottages - Chelsworth is, you can see Gladwins Farm Cottages - Chelsworth on the map below. Gladwins Farm Cottages - Chelsworth is in Suffolk; should you be on the lookout for a special offer, you can find all the special offers in Suffolk. It's always worth checking to see what is on offer at the moment. Do you want to holiday near Gladwins Farm Cottages - Chelsworth (31082), you can see other cottages within 25 miles of Gladwins Farm Cottages - Chelsworth; have a look to find your perfect holiday location.